I have this idea in the history of my personal version of the Christian faith that is grounded in a certain truth but bathed in a particular lie. It is the idea that God will only call me to do hard, difficult, even painful things. I say it is grounded in truth because I do not believe that God’s purposes for our lives are all about our health, wealth, and prosperity. I believe He wants us to learn to live well according to the principles of an unseen Kingdom and that may or may not include health, wealth, or prosperity. But it is a lie because by focusing on the inevitability of suffering in this life and the fact that God is not solely interested in my own particular happiness, I forget that God’s plans for me also come from the kindness of a good Father. I know I am not alone. I know others share this imbalance because I hear it in their decision making, in their explanations about life choices, and in their praise or disdain for the plans others make with their lives. We forget that sometimes God leads us to green pastures. Sometimes he “satisfies us with good things so our youth is renewed like the eagle” (Psalm 103). It can be confusing. Coming from a place of loss after the birth of premature twins, I feel pangs of sadness when I hear a proud parent say, “Praise the Lord! We prayed and He blessed us with two healthy babies.” Are they wrong? Of course not! It is just that I remember that I prayed too and my result was different. Does that mean I am not blessed? No. It means sometimes life does not go according to what we hope or want or desire. But we are always blessed. We can’t censor our language for every possible scenario. We’ll have very little left to say. After a day like today, I remember His goodness. 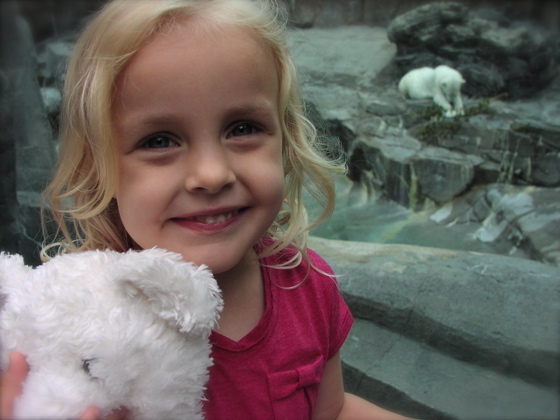 Today, the day before Macy’s fourth birthday, we traversed the zoo at her every whim and wish. All day long. And she never once took advantage of that gift. She simply enjoyed it, soaked in every moment, savored every exhibit. I can’t always give her exactly what she wants. (In fact, even today she was denied the most expensive of plastic toys in the zoo gift shop.) Sometimes I even have to watch her suffer when I wish it could be different. But I never leave her in those moments, and I share her tears and I hope for better days – days like today when even the heat and bugs seemed to stay at bay for our occasion. If I can’t get a better day, I’ll have to hope for an entirely better life, an everlasting one. the God of pleasure and kindness and generosity. Oh! Hurray for Polar Bear Days to remind us of this portion of the Truth. That statement is so applicable in our society, I think. We don’t give each other much space to figure things out as we go. well said felicity. enjoying your blog very much. Thanks, Brad. It is nice to hear from you. Chime in more often! Wow, this resonates with me intensely. Yes, you are not alone in this thinking. The “valley of shadow and death” seems so overwhelming that the “green pastures” seem overshadowed some days. So I’ll chime in with Mama Kathy with the “Hurray for Polar Bear Days” sentiment. This was very timely for me to read today. Why some prayers are answered and others are not is His pleasure, and it’s so hard for us to accept sometimes.